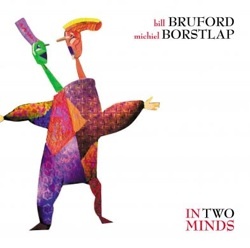 Bruford - Borstlap's "In Two Minds"
Last May, I attended the 2007 edition of the Bath International Music Festival. In addition to being one of England's most beautiful and architectural cities, Bath attracts some of the greatest musicians from around the globe; Mavis Staples & Jazz Jamaica, the electronica of Arthurs & Bown and People Like Us; the folk stylings of Martin Hayes and Dennis Cahill; and the genre crossing Iain Ballamy & Stian Carstensen. My personal favorites however, were the jazz duo of drummer Bill Bruford and pianist Michiel Borstlap. After a high profile and illustrious career as the rock drummer of his generation (with Yes, Genesis and King Crimson), Bruford carved out an equally successful name as a jazz drummer through his jazz-rock ensemble Earthworks. Borstlap is a brilliant pianist, capable of creating solos of dazzling complexity, but also able to employ space and subtlety. Together they adopt a witty, conversational style: the table talk may turn as much to Liszt Scherzos as to jazz standards and free spirited improvisation. Now comes a recording of that performance in Bath and Norway, the aptly named "In Two Minds". 'In Two Minds' is the second CD to come from this pairing of fine musicians, and will no doubt be hugely anticipated by the large and dedicated fan base built up by these two artists in addition to their own separate respective fan bases who have witnessed them in concert since the duo's first formal collaboration back in 2002. Recorded in 2007, 'In Two Minds' features eleven intimate and conversational tracks of new, original material, and a stand-out reading of the Miles Davis classic 'All Blues'. Released on the Summerfold imprint, the Bruford-Borstlap Duo will again be playing selected live dates in the run up to the release of this album, including their London debut at the London Jazz Festival on 24th November 2007. I saw Bruford's first piano-drum duo with the Swiss keyboardist Patrick Moraz in 1982, at New York City's now defunct Bottom Line, and later in 1983, at D.C.'s also defunct Bayou. Bruford and Moraz had released two albums, the acoustic "Music for Piano and Drums", and the electronic "Flags". Consequently, these recordings and others have been reissued on Bruford's new record labels: Summerfold and Winterfold. With their first CD, "Every Step A Dance, Every Word A Song", and a DVD titled "In Concert In Holland", Bruford teamed up with Dutch keyboard master Michiel Borstlap, in duets culled from their 2003-2004 European tour. Although the duo's efforts are rooted in jazz, there are hints of the progressive-rock/New Age flavor of "Flags", where Borstlap employs synthesizer for choruses and textures, and Bruford's well known polyrhythmic beats and syncopations that propel this beautiful musical journey. 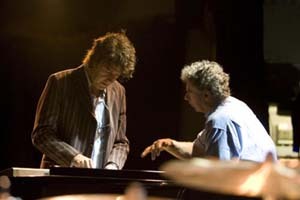 Bruford met first Dutch pianist Michiel Borstlap in 2002, and they began playing duo shows that were less about the confines of structure and more about what Bruford terms "performance-based" music, music of the moment where spontaneity and interaction were the predominant factors. Gratefully, the duo returns with "In Two Minds", a live recording of their summer 2007 tour of Norway and England. The "Left of the Dial" reviewer Glenn Astarita once noted that "Borstlap primarily uses a grand piano as his instrument of choice via a potpourri of swing vamps, and sublime moments, while Bruford's shading exercises, add color and additional warmth. Highlights include segments where the duo expands themes and unexpectedly switch gears as they often instill a polytonal outlook during jazz standards such as Monk's "Bemsha Swing," for example. The piece titled "Swansong" from their first CD, is a compelling opus that defines the artists' overriding sense of musical intimacy coupled with power and tenacity. Here, Borstlap executes slashing crescendos amid Art Tatum-like chord voicings, as the unit melds quaint balladry with bluesy passages. The fun factor continues with Bruford's drumming onslaught, which serves as a prelude of sorts, to Borstlap's shrewd use of a synth chorale voicing to finalize the piece. Simply stated, it's about synergy and singular techniques rooted with elements of joy and precision. Some of my favorite pieces from the new CD include the log drum driven "Conference of Bees," "The Art of Conversation" and another abstract, yet faithful reading of the classic Miles Davis tune "All Blues". Bruford may gently assert the forward motion, but he's also become a masterful colourist. And while Borstlap's supplementing of his piano with electronic keyboards sometimes gives the duo a broader complexion, the subtleties of their exchange are never overshadowed by sheer demonstrativeness. There were other fine moments from the Bath show not found on the CD, like the hilariously titled "Sharp Objects in Search of Shade" and I'll never forget Borstlap's playful bit of Gershwin at the end of the concert, however the selections chosen for " In Two Minds" are very fine indeed. "In Two Minds" is yet another step forward for Borstlap, already a well-established European jazz figure, and truly represents one more advance in the pursuit of a more instinctive and natural approach for Bruford, an artist who has, for all intents and purposes, left his rock roots completely behind him. I absolutely loved it.This CD and others from Bruford's ever growing catalogue can be found on his website: http://www.billbruford.com.